Whatever I have tried to do in life, I have tried with all my heart to do it well; whatever I have devoted myself to, I have devoted myself completely; in great aims and in small I have always thoroughly been in earnest. A great man wrote these lines, Charles Dickens himself. He was also the one that wrote the Christmas Carol and Oliver Twist. A hard working English man well known for his art work. But my dad always said, good work comes from a satisfied tummy. When you’re hungry, you can’t be productive. I guess that was true then like it is true now. 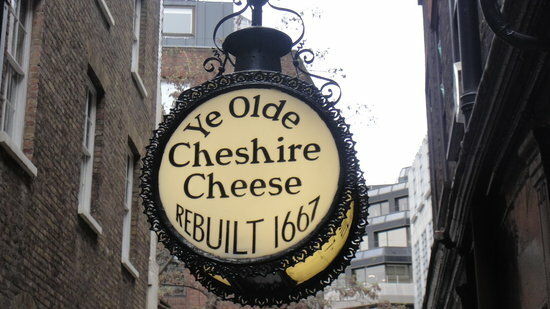 Charles Dickens must have felt about the same and he too found his favorite place to sit and eat and write: Ye Olde Cheshire Cheese, in the heart of London. When A read about it, and found out that the pub was still open, he insisted that we would go and check it out. This was on our first day in London and I honestly did not care where we ate, as long as I could eat something. So we made our way across the city, just so we could eat where Charles Dickens ate. As we entered the pub, a smokey smell immediately hit us in the face. The kind of smokey smell you get from smoking salmon, not the kind of smoking cigarettes. It kind of was a turn-off for me but for A? Heaven on earth. So we walked in the dining room and waited to be seated. 5 minutes into the wait, A decided to ask at the bar, if we should seat ourselves, the bartender shrug her shoulders and said, to just wait, eventually someone would come by. And she did, about 10 minutes into our wait. She offered us the booth next to the fire which for A made all the wait worth waiting, since he now sat where it was said that Charles Dickens used to sit. To be honest, this wasn’t the most comfortable of booths I have ever been in, the seating space was limited and you had to brace yourself against the table, so you wouldn’t fall off the booth, although the furniture was made of dark wood and it definitely looked rusty and had a certain charme. The waitress came around and brought us some menus, A already knew what he wanted without looking at the menu: an ale and steak and kidney-pie (it looked like it sounds), after careful consideration I chose bangers and mash (sausages and potato-mash). From here on out it just got more and more ridiculous. We realized that the booth in front of us was seated with two Californians and two Canadians and they were as loud as they come. Getting drunk in the middle of the day, being loud and ridiculous. A instantly turned on his English accent, to not be associated with them. But have you ever heard me with an English accent? Probably not, I only got one and that’s South-Phillie. Everything else just sounds like I am mocking other people’s accents, no matter how hard I try to imitate, I will always sound like a crazy person with a bad accent and a bit drunk. A recently started making his own mayo, so we both knew that making mayo took only about 5 minutes, so when after 25 minutes she still couldn’t get the mayo from downstairs, we began to wonder and hoped for a damn good home-made mayo. Well… after 30 minutes… we finally got our mayo… And it was great-ish… it was packaged… not even the good kind (if there is anything like that? ).